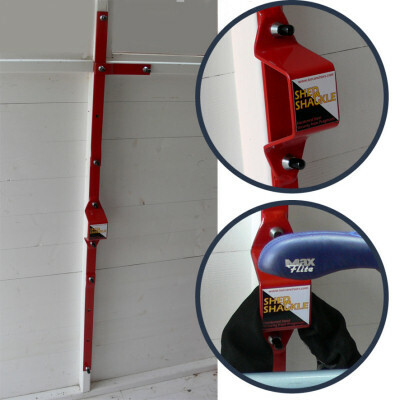 Shed Shackle - The Only Police-Approved Shed Security Anchor, for wooden sheds and now for metal sheds! Police Approval: The Shed Shackle has been awarded Police Preferred Specification status under the ACPO Secured-by-Design scheme. It is the only Police-approved shed anchor on the market. The Pragmasis Shed Shackle improves security for wooden sheds and a variant extends the same principle to metal sheds/bike stores. Thefts from sheds have become more and more frequent and the options for improving your shed security have been either expensive, impractical, or both. Until now! Unlike a conventional ground anchor, the Shed Shackle doesn't require a heavy concrete floor to the shed and actually improves the strength of the shed wall - your shed becomes steel reinforced! Customer Comment: "You might like to know that we recently had our shed broken into with one bike stolen. However, the two bikes we had secured to the Shed Shackle were not touched!! So we have been asked by our residents to order another!! We all think the Shed Shackle is fab!!" If you have high value items in need of protection, a good concrete floor with a Torc Ground Anchor may give you better security, at a higher price, but if a 100mm+ thickness concrete floor is unrealistic or if a floor-mounted anchor will be too awkward to use regularly or if the overall cost would be prohibitive, a Shed Shackle can offer a pragmatic and easy-to-use alternative that is still very likely to deter the thief. British design and manufacture - Support British industry! About 30 minutes to fit - Easy-to-follow and thoroughly illustrated instructions are included. New: Variant available for use on metal sheds and bike stores! Fitting to a Metal Shed? The same Shed Shackle metalwork is just as useful and just as relevant for metal bike sheds/bike huts (see earlier photo). Metal sheds tend to be flimsey structures with poor security, as illustrated on our page that gives advice on metal shed security. The Metal Shed Shackle can give a significant boost to the security without a huge amount of effort or cost. The photo to the right shows a Metal Shed Shackle fitted inside a typical bike store and being used to secure three bicycles with a Protector 11mm chain and a D-lock. Another option can be to install a proper ground anchor, such as the Torc ground anchor, but that requires the bike hut to be placed on a good quality concrete base, or for fresh concrete to be laid specifically for the purpose. That can give higher security, but it can be a lot more work and significantly more costly. The Shed Shackle is modular so you can fit it in many ways. It is made primarily from 30mm x 5mm thick steel bar, and the centre section (with the folded plate shackle) and the long extension bars are all 420mm long. The short side brace is 160mm long. In the usual configuration, with the centre section and both long extensions all in line, the final assembly measures 1200mm long and approximately 174mm wide (the folded plate is 58mm wide, overhanging the 30mm-wide central bar, plus the length of the short side brace). The folded plate is made from 4mm thick steel sheet, hardened to resist sawing attacks etc. It will accommodate a Protector 16mm chain with ease, with the opening spanning a 50x50mm square, approximately. Feel free to ask us if you need any specific dimensional details. What's a shear nut? Why can't a thief simply use a spanner to undo the fixings? Shear nuts have special heads that comprise a conical smooth-surfaced part, which has the thread inside it, and a hexagonal bit on the top that allows you to use a conventional spanner to tighten them up. The key is that as they get tight, the hexagonal bit snaps off. The photo here shows coach bolts (that are used in the kit for wooden sheds) with an un-sheared shear nut (below), and another shear nut but after shearing (above). Hence, once the Shed Shackle is installed with all the nuts tight and all the hexagonal bits snapped off (sheared off), there is nothing left to put a spanner onto. Optionally, threadlock (not included in the kit) can be applied to the bolts to make it even harder for a thief that might attempt to grip hold of the smooth conical part that remains of the nut. (Threadlock is not normally necessary as the shear nuts alone are sufficiently tamper-proof, and there are eight bolts and shear nuts used to fix the Shed Shackle in position!) The outside of a wooden shed just exposes the dome-headed end of the coach bolts and we use specially shaped bolt heads in the metal shed kit, so not only the nuts have no remaining hexagonal part to put a spanner on, neither do the bolts. The Shed Shackle is Sold Secure approved to Domestic Silver standard. The Shed Shackle is also approved by the Police Secured-by-Design initiative - it is the only shed anchor with Police Preferred Specification. We have our Sold Secure and Secured-by-Design certificates available online so you can print your own copies, should you need them to prove certification for your insurance company etc. We have another page that gives more details on the Shed Shackle for wooden sheds, including tools required, and also several photos of example installations. Similarly, we have more details on the Shed Shackle for metal sheds and similar metal-walled structures such as bike huts and cycle stores. We also have more general guidance on security of wooden sheds and on security of metal sheds. Since the Shed Shackle is a modular product, it can be used in a variety of situations. If you have any queries that are not dealt with by the above, feel free to contact us for clarification. The Shed Shackle is available on its own and in various Package Deals with large discounts. Reseller enquiries are welcome. Read our customer testimonials and also magazine reviews.